This is the season of happiness, love & dreams. Wedding season, Christmas, New Years – just too many reasons to venture out of your homes! But it gets even better – how about combining the reasons, subtracting the expenses and multiplying fun! We are talking about Destination Weddings here. A destination wedding in simple terms is one in which the wedding is hosted in a vacation-like setting, at a location to which most of the invited guests travel to and often stay for several days. The destination could be gorgeous beaches, lavish forts and palaces, amazing farmhouses, or full blossomed garden, snow covered fairytale locations. In short – any place can host a destination wedding, as long as the bride & groom are okay with it. The concept of destination weddings is on the rise these days, not only abroad but in India as well. No doubt these weddings require a lot of planning and research but so does every wedding – even a simple one. Not only this, destination weddings provides a refreshing look at the customs & rituals; it’s a vacation plus wedding for all! And getting married in a paradise – who wouldn’t like it? Guests as well as the groom & bride not only get to enjoy the venue, wedding excitement just adds a zing to all the celebration! But now let’s get down to business – coming to the budget, the main and very important aspect of every planning (wedding or vacation). You see, in a traditional wedding, the bride and groom’s families have to pay for all the setup, feasts, etc., then later for reception and again for the honeymoon. These all account for double & in fact more of the expenses actually required. But if you bring it all together – getting married at the favorite destination, bookings, traveling, feasts, you can actually save on a lot of cash plus most of the time. 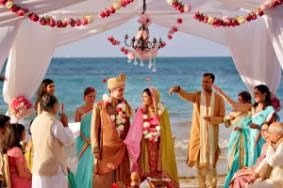 Many of the destination wedding planners also provide amazing discounts on the entire package which generally includes traveling, stay, wedding ceremonies, photography, feasts and much more. So here is yet another reason to pack your bags and go to your dreamland – to get married!